Skin and Pore Cleansing and Detoxification Techniques – Most of us have no idea that we are all infested with these skin and pore parasites. This course will give you the ability to detoxify and rehabilitate the skin in many ways. I perform these protocols daily at least, and one time a week I do super cleansing protocols with the mineralized vodka solutions. I am going to deeply clean my body from head to toe with the skin and pore protocols. Wait until you see the pore scum that comes out of my skin. These skin and pore cleansing and detox protocols, practices and principles may take you several times to get anything to come out of your skin and pores if they are severely plugged. In time the skin and pores will start to open up/release more, and you will see more debris coming out of your skin onto the towel. Watch a lot of the sauna workshop videos we have. You will get an idea on how we use these techniques on many different types of skin, quality and age of real participants at the health retreats we do in Hawaii. We also have many personal workshop videos, that I share with you, on how I do the protocols on myself. 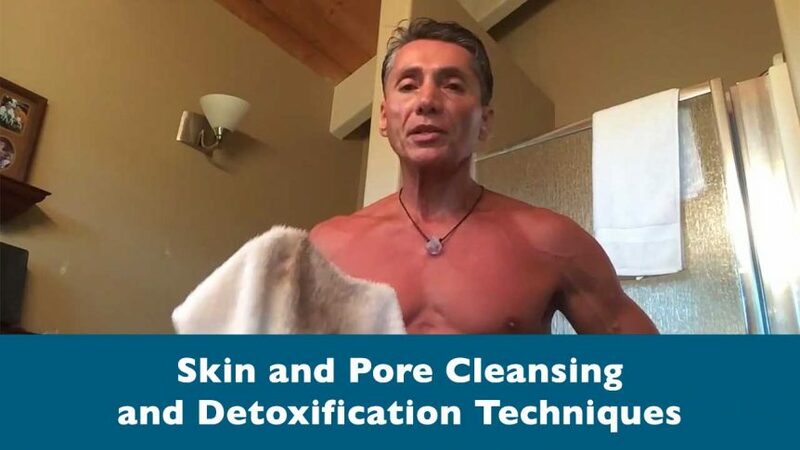 This informative video will give you an idea of what I personally do on my “Spa Day”, with various Skin Cleaning, Detoxification and Rejuvenation techniques/protocols for cleaning, detoxing and protection of the body, mind and our machines skin. The protocols I am going to show you are what I have personally learned in over 45 years of constant researching and experimentation in the areas of “Terrain Modification”, with the theme of optimizing, enhancing and upgrading. Most people are not aware they are massively infected with these really small elusive parasites, and in most cases are invisible to the eye. Not only to us seeing them, but also for the body to detect them and fight them off as pathogens. These very small parasites have secretly infiltrated into our skin and pores and are the starting of all other parasites to enter as well. Fun Fact: The “Skin” is largest detoxification organ we all own in our bodies. This essential detoxification organ called the skin, weighs in at approximately 10 pounds on the average person. These skin and pore parasites plug up the skin and cannot be shed through this essential skin detox organ. The skin and pores are one of your most important and largest organs that you have for detoxification. You skin is your protective “Armor Shield” to the outside, world from parasitic creatures getting into your body and mind. We will show you first how to clean your skin and pores, and then go into the sauna and purge all the things that are living in the pores. Then we will show you how to put on the protective lubricant. Recommended Courses: Vodka Skin Cleaning Solution, Learn Skin and Pore Cleansing Detoxification with Beatrice and Making and Applying the Vodka Skin Cleaning Solution. All products needed for skin and pore cleansing are wholesale at earthshiftproducts.com. We have the best Organic Superfoods, Minerals, Household Upgrades, Cold Processed Herbs, Cacao and Coco Oils and many more essentials all wholesale direct with free shipping promotions all the time in the 48 states. We also have world wide shipping. I’m having a hard time finding the alcohol recipe. Any help would be appreciated!